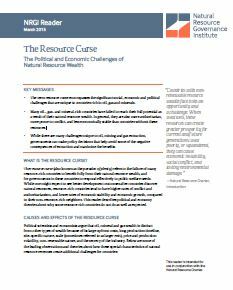 Countries with nonrenewable resource wealth face both an opportunity and a challenge. When used well, these resources can create greater prosperity for current and future generations; used poorly, or squandered, they can cause economic instability, social conflict, and lasting environmental damage. The term resource curse encompasses the significant social, economic and political challenges that are unique to countries rich in oil, gas and minerals. Many oil-, gas- and mineral-rich countries have failed to reach their full potential as a result of their natural resource wealth. In general, they are also more authoritarian, more prone to conflict, and less economically stable than countries without these resources. While there are many challenges unique to oil, mining and gas extraction, governments can make policy decisions that help avoid some of the negative consequences of extraction and maximize the benefits.